ISLAMABAD: As official relief agencies struggle to reach out to thousands of marooned river communities, international donors appear reluctant to wire their assistance through trust-deficient Pakistan government, officials told The Express Tribune here Thursday. Representatives of donor organisations and ambassadors of various countries cold-shouldered a request by President Asif Ali Zardari, seeking direct assistance. President Zardari on Thursday met envoys of the US, the UK, EU, Germany, Iran, Saudi Arabia and representatives of international donor agencies to review the ongoing flood situation and relief activities. Foreign Minister Shah Mahmood Qureshi also attended the meeting. The president urged the donors to provide direct assistance for better utilisation of funding. He assured the donor countries and agencies that the government fully believes in transparency and accountability in the use of funds. “Each penny will be spent for relief and rehabilitation,” he claimed. Foreign Office spokesman Abdul Basit confirmed that Pakistan wants aid to be channelled through the government. “We have requested the donors to route their aid through government,” he said, adding utilisation of aid through NGOs has administrative cost. However, international donors would not agree. “It is not possible for us to give direct aid to the Pakistan government,” a western diplomat, who attended the meeting, told The Express Tribune. 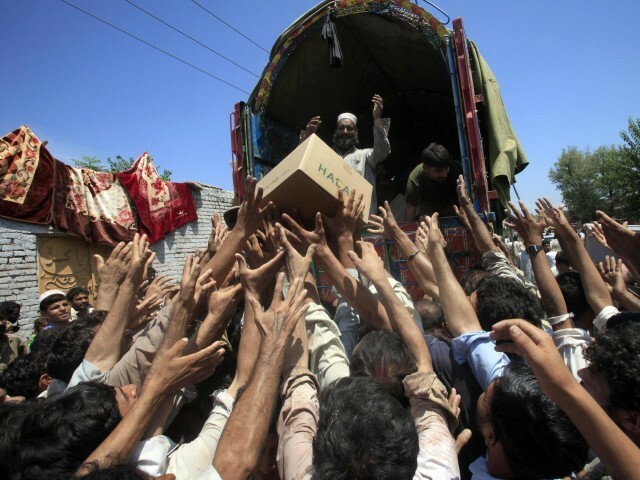 “We have our own system to deliver aid. We want every dollar to be used appropriately,” he added, requesting anonymity. The global community is spending most of the assistance through NGOs, casting doubt on the credibility of the government. Meanwhile, a statement issued by the president’s media office said President Zardari in a meeting with ambassadors and representatives of donor agencies called for quick disbursement of the pledged funds. He said the assistance by the international community was a short-term measure to deal with the worst flooding in history. “The long-term remedy to compensate such stupendous loss consists of allowing enhanced market access for Pakistani products, according preferential trade facilities, creating ROZs and more investments in the country,” he added. Published in The Express Tribune, August 27th, 2010.